From 2003 to 2009 I worked as a researcher in the group Complex Photonic Systems, led by Prof. W.L. Vos. We investigated photonic band gap crystals, Anderson localization and diffusion of light, random lasers and related phenomena. 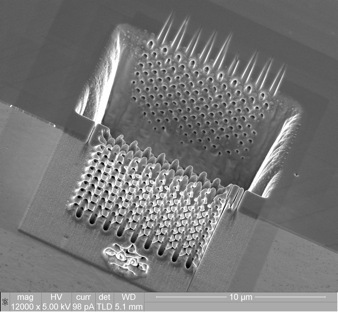 I was mainly involved in the fabrication of photonic structures in silicon or gallium phosphide, using a wide range of techniques including wet and dry etching, focused ion beam, and e-beam. The work was done in close collaboration with Philips and ASML. I continued the work I did in Utrecht on porous GaP. In order to make porous GaP with bigger pores we tried several different electrolytes, including aqueous solutions of HNO3. Interesting phenomena were found. 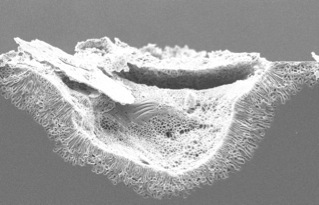 When GaP is made porous in 1 M NHO3, gigantic pores can form. In strongly scattering materials which amplify light lasing can be observed. We made a so-called 'random laser' out of porous GaP. We have directly measured the size of the area of which the light originates from. The results, that give a satisfactory answer to the question what the origin of random lasing is, show that random-laser light originates from small areas inside the laser. These local cavities have a unique emission pattern depending on the structure of the sample. Most of this work was done by Ir. K.L. van der Molen. Schematic picture of a random laser made from porous GaP, in which two lasing modes are shown. Other work involves the fabrication of photonic crystals in Si and GaP, in close collaboration with Philips and ASML. 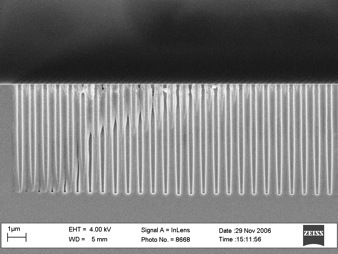 A photonic structure in GaP, made using a focused ion beam. In this project we made nanopores with diameters smaller than 500 nm, and aspect ratios of up to 26: a world record. Pores made in silicon using a reactive ion etching process. 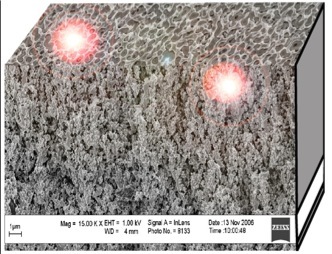 The pores have a diameter of 306 nm and a depth of 6 um (aspect ratio 20). The structure we made in 2009 functions very well as a 3D photonic crystal. 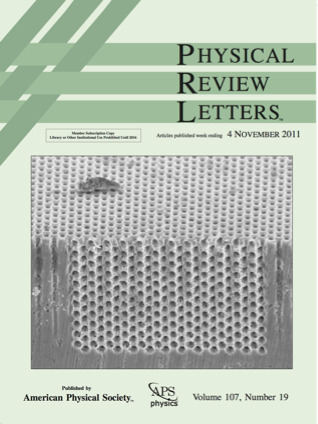 We made the front page of PRL with our article about the inhibition of the spontaneous emission of quantum dots!The structure consists of two arrays of pores that were etched in two perpendicular directions.